just an update from experimentdesign amsterdam 2008. nothing design group, who just participated in designboom’s tokyo mart were also participants of the urban play exhibition which was part of experimentadesign. the group of young korean designers, directed by koo jin-woog, presented ‘fish in the sky’ as their contribution to the exhibition. 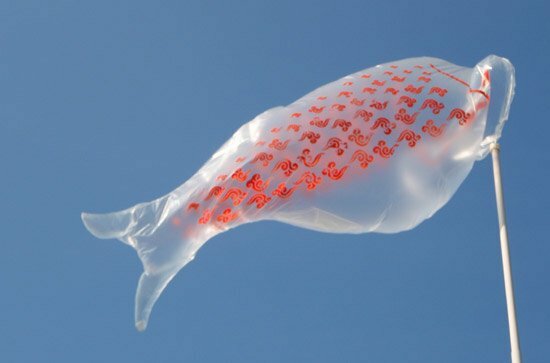 along the IJ riverfront, transparent wind vanes in the shape of fish, were attached to flag poles and soared above. the fish were meant to be a school of dutch herring, with the flag poles acting like fishing rods, which have caught the fish swimming through the sky.